The leader of the Ukrainian Choice public movement, Viktor Medvedchuk has reported that officials in Donetsk have reneged on the first stage of a"10-for-20" prisoner swap initiated by Ukraine. Medvedchuk is Ukraine's special representative for humanitarian affairs in the framework of the Trilateral Contact Group. "On March 5 we offered to carry a first stage of '10-for-20' prisoner swap as one of the possible variants proposed by a district in Donetsk region. 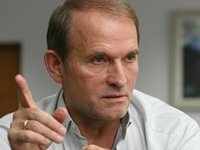 But the district in Donetsk refused," Ukrainian Choice's press service quotes Medvedchuk as saying on March 12. Medvedchuk said information announced in late February by Security Service of Ukraine advisor Yuriy Tandyt about preparations for a "25-for-50" prisoner swap was unreliable. "The whereabouts of 38 of the 50 prisoners is well-known. The whereabouts of the remaining 12 prisoners is not known. Five of the 25 people Donetsk region districts were prepared to swap were not verified by us. This is why the Ukrainian side could not make a '25-for-50' swap," he said. The Ukrainian Choice's press service said Medvedchuk had facilitated the release of 399 people, including military servicemen, volunteer soldiers and civilians, since December 2014.